An amputee is defined as one who is "abbreviated" at or above (proximal) to the wrist or ankle. The game is played without prosthesis, on metal forearm crutches. Wooden crutches are not allowed due to the danger of breaking and splintering. Incidental contact between the ball and a crutch is allowed. But crutches may not be used to advance or direct the ball. Blocking, trapping, or advancing the ball with a crutch is considered a hand pass. Residual limbs may not be used to advance or direct the ball. That keeps it fair, since someone with longer residual limbs would have a distinct advantage over those with shorter residuals. Incidental contact is OK, but a player may not use the residual limb to trap, block, or pass the ball. Hand pass rules apply. Due too the physical demands of the game substitutions are unlimited and may be made at any stoppage. Les Autres - individuals with limb birth defects may play in keeping with the spirit of the game - one "unusable." Two Les Autres are allowed on the pitch at any given time. 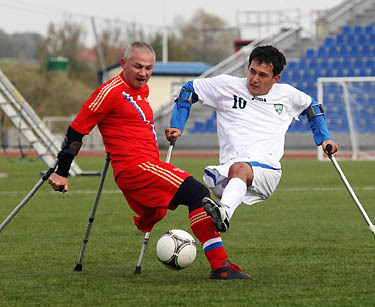 Use of a crutch against another player in an offensive manner will result in the player's ejection from the game and a penalty kick awarded. Period. Outdoors: 60 x 40 meters +/- 5 meters. Indoors: A school gymnasium basketball court can serve as a pitch. Amputee football has also been played in indoor arenas. In such case using the sidewalls for passing and bank shots is allowed. The Goal: Somewhat smaller than in the two-legged game - 2 meters high x 5 meters wide x 1 meter deep. Duration of Play: Games consist of 2 periods of 25 minutes each, with a 10 minute rest interval between periods. International Rules - 6 per side, plus keeper. Local teams may also play 4 x 4 rules. Goal Keeper Rules: The goal keeper is not allowed to leave the penalty area, if this occurs and is deliberate, a penalty is awarded to the other side and the goalkeeper dismissed from the field of play (Red Card). Play Against "Traditionally Configured" players: Yes, there will be times when you'll want to play, both recreationally and competitively, against teams with two-legged players. You'll both love it. Two-legged players must play the game on crutches. They must remove one shoe and may not put the shoeless foot down during play. Using the shoeless foot for running or shooting foot results in a hand-pass call and ball turn-over. The two-legged team goalie must play one-handed.